As a tour guide, I spend a lot of time on the road. Long days, active itineraries, and constant interaction quickly take a toll on my energy and nerves. But after two successful summers, I’ve learned to pack a bottle of wine along to relax with and enjoy in my hotel room in the evening before bed. 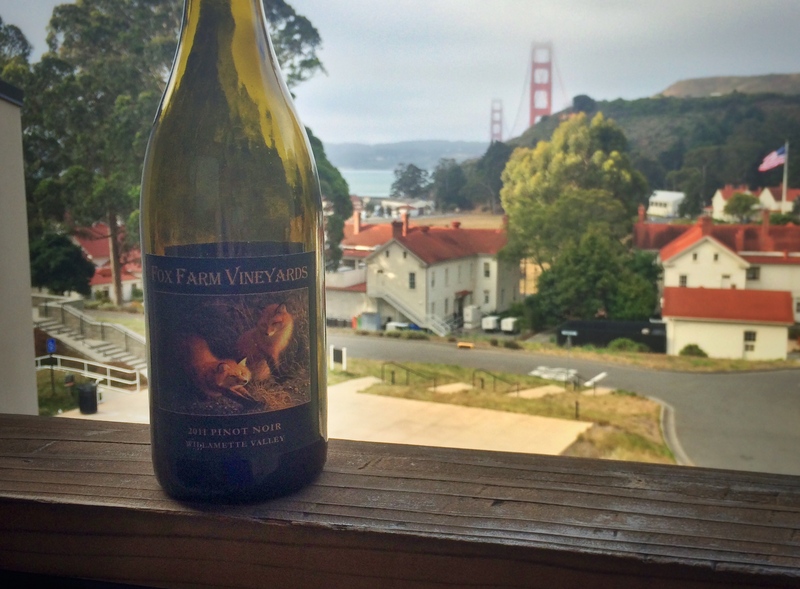 On my most recent multi-day trip on the road, guiding from Portland to San Francisco, I tucked a bottle of Fox Farm Vineyards‘ 2011 Pinot Noir in my rainbow print suit case. Featuring notes of black cherry, plum and touch of cocoa, the Pinot Noir sipped smoothly after having several years in the bottle to mature. The 2011 vintage for Oregon was a cold one, so these wines are just starting to come into their own now. Since I first sampled this wine last year, it has rounded out nicely and now finishes with classy earth and dust tones. Sipping the last drops from the patio of my hotel in Sausalito overlooking the Golden Gate Bridge, I savored this trip saver.